Keeping the ball rolling with more new stuff, NYC axed a few of its In A New York Minute quick dry shades at the end of last year, and you know what that usually means. I was happy to see seven new shades at CVS just before xmas. (I've seen them at Rite Aid since.) 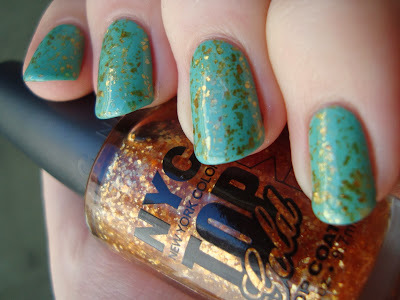 One of the seven is the Disco Inferno glitter topper from last fall's Disco Inferno collection. There's another topper called Top Of The Gold that immediately reminded me of something. I snatched a bottle of Top Of The Gold right up and (since they were BOGO50 that week) took a long look at the five pastel-ish creams. Pastels aren't really my thing (most look pretty awful on me), but Mint'ed On Broadway looked like it might work, so it came home with me too. I'm kicking myself a bit for not getting the names of the other shades. Sorry! I think they've been posted on Nouveau Cheap by now. Mint'ed On Broadway is a soft aqua cream. I hate snow, but it does make for good lighting. I wasn't sure about the color in the bottle, but I found it really flattering once I put it on. The formula was just ok. It flooded a bit, which you can tell from my photos. It was opaque enough at two coats, but I added a third when the second coat bubbled. The third stayed smooth, thankfully. When I added Mint'ed On Broadway to my spreadsheet, it went in under an older NYC shade called Mint Macaroon, from the '12 City Sweets spring collection. It dawned on me that the colors might be kinda close. I had no idea just how close they'd turn out to be! They're not exact dupes, since Mint Macaroon is a touch brighter and a bit bluer, but...wow close! Top of The Gold has gold flakes in a clear base. When I bought these two polishes, I toyed with the idea of layering Top Of The Gold over Mint'ed On Broadway, but I wasn't sure it'd work. I was even wronger about that than I was when I had doubts about Mint'ed in general. I love how the combo turned out! Top Of The Gold applies really well and the flakes are thin and well-behaved. It took more top coat than a shimmer would have, but less than a glitter. I've been going heavy on the top coat lately anyway. The gold flakes are so dynamic and play with the light beautifully. The tone of the gold changes as the light hits it and it's really striking. I can't wear a flakie without wanting to mattify it, so there was no way I was gonna skip it this time. I know it's early to make a call like this, but this combo is absolutely going to be one of my favorites of the year! I knew when I saw it that Top Of The Gold would be at least dupe-ish for Zoya Maria-Luisa, so I had to check them out side-by-side. Oh yeah. Dupes! There's pretty much no difference at all. Application is about the same and so are density and flake size. Bottom line: Top Of The Gold is a perfect dupe of Zoya Maria-Luisa, one of my favorite polishes of last year. It's got a shelf price of $2 instead of Zoya's $9, though it is about 2/3 the size and is "3-free" instead of "5-free". Mint'ed On Broadway is pretty, but the formula's a little floody and it bubbled slightly on me. I'm kinda blanking on what to write here, so have a preview of an upcoming post. I bought the purple in that collection (which I LOVE) but I think I need the good too! Pretty! I wonder how that Mint compares to their Tudor Teal, they seem so similar.